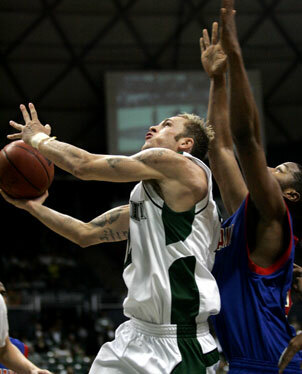 Hawaii's Matt Gibson went up for two of his 16 points past Louisiana Tech's Adrian Rogers. Bobby Nash scored 16 points to lead four Hawaii players in double figures as the Rainbow Warriors pulled away from Louisiana Tech for a 71-57 win last night at the Stan Sheriff Center. With the win the Rainbow Warriors (10-11 overall, 6-3 Western Athletic Conference) moved into a tie for third place in the conference, while Louisiana Tech (3-16, 0-7) remained winless in league play. Matt Gibson scored 14 points and dished out seven assists and Jared Dillinger and Riley Luettgerodt finished with 11 each for the Rainbows. Kyle Gibson paced LaTech with 16 points. Louisiana Tech stayed with the Rainbows for much of the night and trailed by five with less than 9 minutes left when Nash drained back-to-back 3-pointers and Matt Gibson added another trey to give Hawaii a double-digit lead. Another 10-2 UH run down the stretch then erased any lingering doubt. The Rainbows now have a week to gear up for a nationally televised game at Nevada. Their game with the Wolf Pack at 1 p.m. Saturday will be shown on ESPN2. 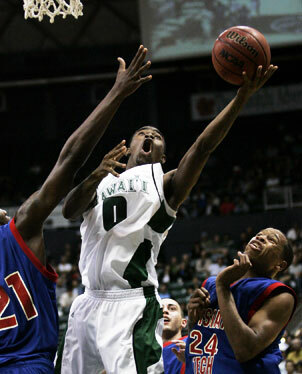 Three was certainly a magic number for the Hawaii basketball team. Three straight wins have vaulted the Rainbow Warriors into a tie for third in the Western Athletic Conference, and a trio of 3-pointers in the second half proved to be the turning point for the Warriors as they pulled away from a feisty Louisiana Tech team for a 71-57 win last night at the Stan Sheriff Center. With Hawaii leading by five with less than 9 minutes left, Bobby Nash knocked down two 3-pointers and Matt Gibson added another and the Rainbows took care of business against a LaTech team still winless in league play. "We did what we needed to do and grinded it out and got the win," Nash said. "We went into the half we were lacking some defensive principles and heart at that point. We went into the locker room, got chewed out, and said we needed to pick it up and we did." The Rainbows (10-11, 6-3 WAC) ended their homestand tied with New Mexico State in the WAC standings, one game behind leaders Utah State and Boise State, and a half-game ahead of Nevada. Hawaii, coming off a 23-point win over New Mexico State last Thursday, began the second half of the conference season by putting together another balanced performance before a crowd of 4,376. Nash led the Rainbows with 16 points, while Gibson finished with 14 points and seven assists. Jared Dillinger and Riley Luettgerodt scored 11 each. Luettgerodt also pulled down a game-high eight rebounds. "We found a good rhythm in the New Mexico State game and it carried over to today," Gibson said. LaTech, ranked last in the WAC in shooting entering the game, shot 58 percent in the first half and stayed right with the Rainbows until Gibson and Dillinger both hit 3-pointers in the final 35 seconds that sent Hawaii into halftime with a 41-32 lead. Kareem Nitoto of Hawaii sliced between Brandon Mims and Dwayne Lathan of Louisiana Tech for a score last night. The Bulldogs continued to hang around and closed to within three at 48-45 with 11 minutes left when Kyle Gibson -- who led the Bulldogs with 16 points -- blew down the lane for a two-handed slam. The Rainbows were clinging to a 52-47 advantage when they broke away with a 13-4 run highlighted by Nash and Gibson's hot streak from outside. Nash drilled two from the top of the key, and after Kyle Gibson's layup rimmed out for LaTech. Kareem Nitoto found Matt Gibson open on the right wing and he drained his second trey of the night to give UH a 61-49 cushion. LaTech got no closer than eight the rest of the way. UH went on a 10-2 run down the stretch to seal the outcome. "That was our big thing -- let's not give them a 3, let's make them earn 2s," Rupp said. "That's just a breakdown. ... That's the part where playing hard is not enough. You have to play smart and you have to communicate." Hawaii held LaTech to 44 percent shooting after the break while hitting close to 53 percent of its attempts. "We did a good job in the second half of playing solid defense the way we teach it very single day and I was just real pleased with the leadership from Bobby and Matt stepping up to get us going," UH coach Bob Nash said. "Just a great team effort all the way around." Hawaii's rotation was down to nine with senior forward P.J. Owsley in street clothes after suffering a knee injury on Thursday. Bill Amis started in his place and finished with eight points and five rebounds. Paul Campbell posted five points and four boards in relief. "These guys can play," Bob Nash said. "It's just giving them the opportunity and putting the confidence in them that they can do the job when they're on the floor." 3-point goals -- Louisiana Tech 3-10 (Washington 2-3, Clark 1-3, Lathan 0-1, Loe 0-1, Gibson 0-2), Hawaii 6-13 (Gibson 2-3, Dillinger 2-3, Nash 2-4, Nitoto 0-1, Luettgerodt 0-2). Steals -- Louisiana Tech 1 (Gibson), Hawaii 2 (Dillinger, Luettgerodt). Blocked shots -- Louisiana Tech 1 (Washington), Hawaii 1(Amis). Officials -- Winston Stith, Mark Reischling, Terry Christman. A-- 4,376.